Tanzania has been a pioneer in establishing community-level services, yet challenges remain in sustaining these systems and ensuring adequate human resource strategies. In particular, the added value of a cadre of professional community health workers is under debate. While Tanzania has the highest density of primary health care facilities in Africa, equitable access and quality of care remain a challenge. Utilization for many services proven to reduce child and maternal mortality is unacceptably low. Tanzanian policy initiatives have sought to address these problems by proposing expansion of community-based providers, but the Ministry of Health and Social Welfare (MoHSW ) lacks evidence that this merits national implementation. 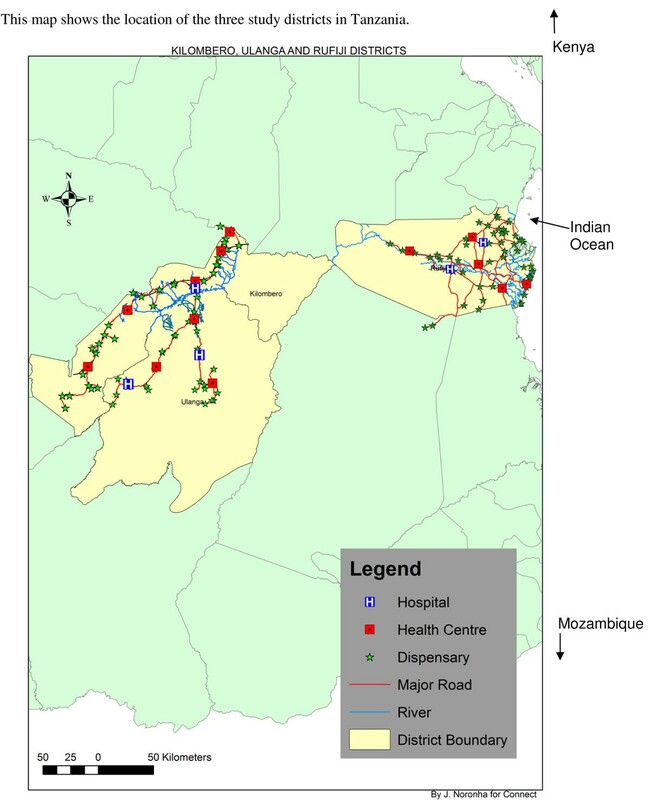 The Tanzania Connect Project is a randomized cluster trial located in three rural districts with a population of roughly 360,000 ( Kilombero, Rufiji, and Ulanga). Connect aims to test whether introducing a community health worker into a general program of health systems strengthening and referral improvement will reduce child mortality, improve access to services, expand utilization, and alter reproductive, maternal, newborn and child health seeking behavior; thereby accelerating progress towards Millennium Development Goals 4 and 5. Connect has introduced a new cadre — Community Health Agents (CHA) — who were recruited from and work in their communities. To support the CHA, Connect developed supervisory systems, launched information and monitoring operations, and implemented logistics support for integration with existing district and village operations. In addition, Connect’s district-wide emergency referral strengthening intervention includes clinical and operational improvements. Designed as a community-based cluster-randomized trial, CHA were randomly assigned to 50 of the 101 villages within the Health and Demographic Surveillance System (HDSS) in the three study districts. To garner detailed information on household characteristics, behaviors, and service exposure, a random sub-sample survey of 3,300 women of reproductive age will be conducted at the baseline and endline. The referral system intervention will use baseline, midline, and endline facility-based data to assess systemic changes. Implementation and impact research of Connect will assess whether and how the presence of the CHA at village level provides added life-saving value to the health system. Global commitment to launching community-based primary health care has accelerated in recent years, with much of the implementation focused on Africa. Despite extensive investment, no program has been guided by a truly experimental study. Connect will not only address Tanzania’s need for policy and operational research, it will bridge a critical international knowledge gap concerning the added value of salaried professional community health workers in the context of a high density of fixed facilities. Tanzania pioneered many aspects of primary health care that were later endorsed at the 1978 conference on International Primary Health Care in Almaty (formerly Alma-Alta), Kazakhstan, through the Alma Ata Declaration. Plans in the early 1970s envisaged the rapid development of rural health centers and dispensaries providing primary health care services as well as launching of a Village Health Worker (VHW) Program . VHWs were intended to extend services to villages, particularly due to the recognition that establishing dispensaries in every village was not immediately feasible . While groundbreaking, these programs encountered challenges in ensuring uniform implementation nationwide and with retention and effectiveness related to provision of systemic support and adequate remuneration . Revitalized in the 1980s with support from child-survival programs, early problems were partly addressed, but the programs were limited by their project-based nature, lack of formalized support systems, and reliance on local government mechanisms for remuneration. By the 1990s and early 2000s, despite the admirable continuing dedication of numerous VHW, many were working as assistants to facility-based providers and were largely maintained through periodic training by vertical health programs; the primary health care component of their work was largely unsupported [4, 5]. Due to the prolonged investment in rural health infrastructure, Tanzania now maintains one of the highest densities of health facilities amongst African countries. Health service organization follows the standard pyramid of dispensaries, health centers, and hospitals (Figure 1). District health system in Tanzania based on MMAM vision. 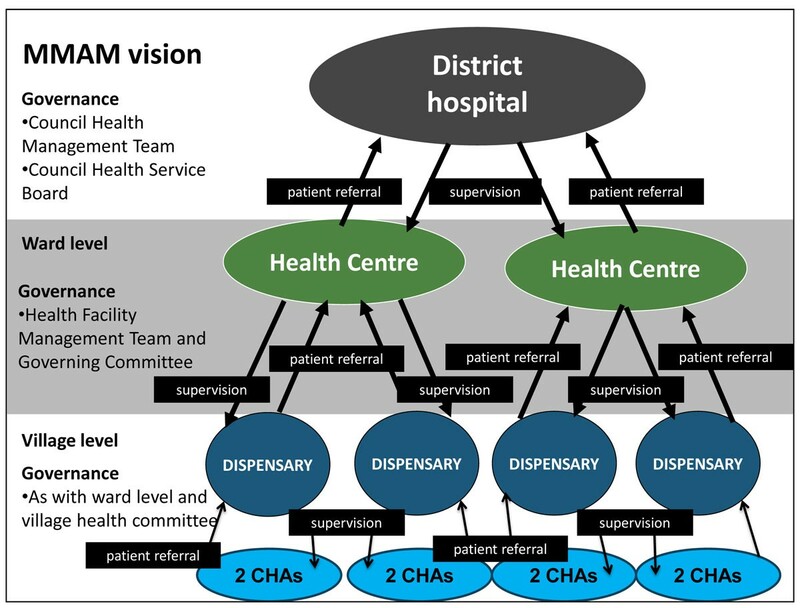 The figure shows the levels of care and interactions at the district health system level as envisioned in the MMAM policy in addition to corresponding governance structures at each level. The Connect project focuses on the CHA at the community level as well as linking the various levels. Connect focuses on the community level as well as linking the various levels through referral and feedback. Household distance to the nearest health center is, on average, 10 kilometres (5 kilometres for dispensaries), but quality of care is often poor, with human resources operating at 32% of the required skilled workforce, insufficient medical equipment, and chronic shortages of medicines and supplies . This is also undermined by weak referral systems that do not adequately identify and respond to acute conditions . Consequently, availability, access, and utilization of essential maternal newborn child health (MNCH) services remain variable across the country. While Tanzania has made substantial progress in the reduction of child mortality and is likely on track to reach MDG 4 , inequities remain with under-5 mortality rates ranging from 84 per 1,000 live births for the wealthiest quintile to 103 per 1,000 for the lowest quintile . In addition, limited progress has been observed in reducing neonatal and maternal mortality, with neonatal mortality now comprising 30% of child mortality . Care seeking for child illness was 57% for acute respiratory infection symptoms or fever and 47% for diarrhea, with declines in appropriate treatment of under-5 malaria and diarrhea in the last five years. Of children with fever symptoms who received anti-malarials within 24 hours, the rates varied from almost 50% for the wealthiest quintile to as low as 36.5% for the lowest quintile. Use of modern contraception (27%) has shown only modest gains in the last five years, with rates of approximately 35% among urban populations as compared to 25.5% among rural. For antenatal care, coverage is near universal at 98% for at least one antenatal care visit but drops significantly to 43% for four visits or more. Women also report late for the first visit, at a median of 5.4 months gestation. Only about half of Tanzanian women delivered in health facilities in 2010 . Postnatal care remains low with 35% of women having received a postnatal check-up within six weeks after delivery. Research has identified interventions that can reduce maternal, newborn, and child mortality as components of integrated primary care [11–16]. Growing evidence shows that many of these interventions can be effectively delivered by community health workers or “lay health workers” at the community level [17, 18]. The Navrongo experiment in Northern Ghana provides an example of the mortality reductions that can be achieved in a relatively short time with the right package of interventions provided at community level [19, 20]. Effectiveness of community health workers in increasing preventive behaviors to improve newborn survival has been demonstrated in Asia . The ability of community health workers to correctly diagnose and treat conditions such as malaria, acute respiratory infections, and diarrhea using integrated management of childhood illness (IMCI) has been established in a number of settings in Africa and Asia [22–24]. Household visits by community health workers, including pregnancy monitoring and counseling, have also been shown to increase utilization of antenatal care, skilled delivery care, and immunization services [17, 25]. Additionally, it is expected that community health workers will have greater cultural competence than facility-based health worker cadres [7, 24]. Although the evidence-base is expanding for establishing the plausibility of community health worker impact, direct trial of the added value of paid community health workers remains the subject of discussion and debate. While there is widespread investment in community-based primary health care, all impact studies have been plausibility trials rather than randomized trials [5, 23, 26]. Moreover, the added value of a paid cadre is unknown in settings such as Tanzania where dispensaries are widespread and community access may not contribute to accessibility, quality, or acceptability of primary health care services. An extensive 2010 literature review of community health worker research revealed the diversity in the types of community health worker programs and substantial knowledge gaps . There have been wide variations in training duration, content, and methods and inadequate attention to management, supervision, and career progression [17, 22, 27]. Additionally, availability of medicines, equipment, and transport are important determinants of effectiveness for service provision, which may also influence credibility among community members and motivation . It is also hypothesized that community health worker programs could reduce system costs by shifting tasks to a cadre with shorter training and low remuneration as well as costs for the user by providing home-based care, but research on the cost-effectiveness is insufficient . Motivation beyond recognition that financial remuneration is needed has also been under-researched . A crucial component of any community health worker’s role is facilitating referrals [20, 21] as a number of interventions to save the lives of mothers, newborns, and child require better access to facility-based care in emergencies and, hence, stronger referral mechanisms from the community [10–15] . For example, there is considerable evidence that emergency obstetric care (EmOC) reduces maternal and newborn mortality, however, inefficient functioning of referral systems often results in delayed treatment and poor outcomes . A recent systematic review of evidence on referral interventions aimed at reducing maternal and newborn mortality found that many are ‘promising’ but conclusive evidence demonstrating their effect is scarce . In addition, there are particular challenges in linking communities in moments of emergency (Figure 1). The government of Tanzania has recently enacted policies aimed at continuing the long tradition of strengthening primary health care quality and access and the linkages between communities and health facilities. Tanzania’s Primary Health Services Development Programme (Mpango wa Maendeleo wa Afya ya Msingi, MMAM), calls for establishment of a dispensary in every village, a health center in every ward, and a cadre of community health workers and strengthening of referral systems . The plan to introduce the new community health worker cadre is, however, still under development. Policy support and approval of the large-scale hiring of salaried community health workers awaits evidence of impact and sustainable costs. Efforts at improving referral have been piecemeal and face challenges in the essential linkage of community to facility. To address this evidence gap, the Connect Project tests the hypothesis that introducing a formally trained and remunerated cadre of community health workers while improving district-level emergency referral systems will reduce child mortality. Additionally, it will improve access, utilization, and behaviors related to reproductive, maternal, newborn, and child health. Connect will also use quantitative and qualitative implementation data to provide operational guidance to the Ministry of Health and Social Welfare (MoHSW) in developing the community health worker cadre and strengthening emergency referral systems. Table 1 shows the core objectives of Connect. A community-based cluster randomized trial design represents the most rigorous possible appraisal of the effectiveness of the community health agent (CHA) in the context of district health systems. The study is being implemented in three rural districts in Tanzania. The districts, and corresponding study villages, were selected to build upon previous and ongoing efforts to strengthen primary health care planning and facility services, as well as due to the presence of ongoing Health and Demographic Surveillance Systems (HDSS). The HDSS areas are comprised of 101 villages and 50 of those villages are randomly assigned to the CHA intervention. The village was chosen as the unit of randomization in order to align the design with the anticipated primary organizational unit of any national program that would recruit, train, and assign CHA to districts. The CHA introduction and activities to strengthen emergency referral constitute complex and interrelated interventions requiring multiple processes that correspond with the six building blocks of the health system proposed by the World Health Organization . Figure 2 illustrates how the project hypothesizes that the inputs and activities across the six building blocks will ultimately leading to changes in population health. Although the diagram shows a linear progression from inputs to impact, Connect also aims to better understand the non-linear and unpredictable results as well as the multiple feedback loops that typically occur with the introduction of complex interventions into dynamic health systems . Connect project theory of change. 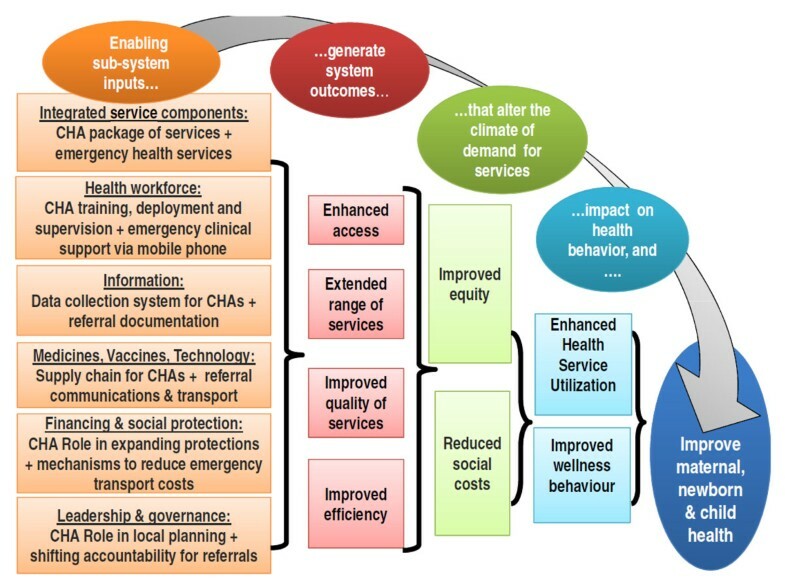 The diagram illustrates the theory of change for the Connect project hypothesizing the effects that project health systems development inputs related to the CHA and Emergency Referral intervention components will have on systems' level outcomes and ultimately outcomes and impact at the population level. Connect is the result of a strategic partnership between Ifakara Health Institute (IHI) in Tanzania, Mailman School of Public Health at Columbia University (MSPH), the Tanzania Training Center for International Health (TTCIH), Council Health Management Teams (CHMT) in the three study districts, and the Connect Advisory Group (CAG), comprised of focal persons from the MoHSW, donor and multilateral partners, and civil society representatives. IHI is responsible for overall program design and implementation, including evaluation efforts, with technical assistance provided by MSPH. TTCIH led the design and implementation of the training program. Following an intensive initiation period, CHMTs from the three districts are incrementally undertaking more and more responsibility for implementation with support from IHI coordinators. The CAG convenes twice annually to review progress and results and provide advice on overcoming challenges. Across the three study districts, the census projections for 2010 estimate a total population of approximately 857,000 . Just over half of the population is female (51.7%). In terms of age, 14.0% of the population are children under 5, while 28.5% are between 5-14 and 42.5% between 15-50. Of the total population, 362,307 reside within the Health and Demographic Surveillance Systems (HDSS) catchment area with HDSS populations for Kilombero, 197,393; Rufiji, 124,192; and Ulanga 40,722. Kilombero and Ulanga are isolated, impoverished districts that lie between 124-248 miles (200-400 km) from Dar es Salaam in the Morogoro Region of Tanzania (Figure 3). These areas are predominately rural and rely primarily upon subsistence agriculture. The Rufiji District is located in the Coastal Region and is also rural. Most inhabitants are subsistence farmers, though there is some trade in fishing and wood products. Transportation and infrastructure in all three districts are poor. The major causes of mortality in these districts are malaria, acute lower respiratory infections, tuberculosis, AIDS, and perinatal causes. Immunization coverage ranges from 85% for Bacillus Calmette-Guerin (BCG) vaccination to 66% for measles in children 12-23 months of age. Nearly 90% of the population in this study area lives within 5 km of a formal health facility [36–38]. Several district health systems strengthening programs have been implemented in these districts by the IHI. Most recently, these include the Tanzania Essential Health Interventions Project (TEHIP), which developed tools to facilitate evidence-based planning in districts; the Empower Project, which focuses on further strengthening district planning for maternal, newborn, and child health as well as facility-based MNCH services; and the ACCESS Project, which uses monitoring and rewards systems to motivate facilities to improve quality of care [36, 39, 40]. The new cadre are called community health agents (CHA) to emphasize their role in facilitating linkages between the community and the health system. A CHA is defined as a health care worker who is formally trained and employed by the health system, provides a package of health services in the community, and connects people across the household to facility continuum. CHAs are members of, selected by, and accountable to, the communities where they work. • Main topics are: family planning; antenatal care; delivery care; post-natal care; child health; HIV and STI prevention; water, sanitation and hygiene and environmental health. • Depending on mothers’ voluntary disclosure, encourage HIV diagnosis of the newborn and infants at 18 months. • Link PLWHA to support groups. The below table provides an overview of the main tasks CHA are trained and authorized to provide. Utilizing all of the 101 villages under surveillance in the three districts, villages were randomly assigned to intervention (50) and comparison (51). The number of CHA to serve in each of the intervention villages was determined as one for a population of <1,000; two for a population of 1,000 – 3,999; three for a population of 4,000 – 6,999; and four for a population of >7,000. To recruit the CHA, local government solicited and screened applications and then convened a village meeting where qualified applicants were selected through voting. The minimum qualification was completion of a secondary education. Each CHA underwent a nine-month pre-service training in a residential competency-based program after which they were awarded a certificate that allows career progression. The training topics include human biology, community health, clinical skills, reproductive health and family planning, IMCI (including community case management), essential newborn care practices, disease prevention and control, and advocacy and communication. Due to training capacity, CHAs were trained in two cohorts with a total of 57 in the first round and 56 in the second round. All graduates were deployed to their home villages. A third cohort was trained in 2012-13 to increase the minimum number to two CHA per village based on early implementation feedback and to align work assignment according to official government decisions to create hamlets. Although the third round of training did not alter the experimental design, 32 CHA are being added to treatment villages to respond to decisions by the government of Tanzania to create administrative and political functions for hamlets within villages, which necessitates recalibration of CHA work areas according to this new political arrangement. After graduation, CHA are officially contracted and paid as employees of their local government with project funding. System supports and linkages for the CHA are coordinated by a member of the CHMT. The supervision design is dual: nearby health facility staff provide supervision for technical issues and village governments provide supervision for administrative issues. Health facility supervisors hold a qualification equal or above that of an enrolled nurse. Village governments select a member of the community to serve as the village supervisor based on education level, age, residence in the village, and status in the community. Neither supervisor receives payment for their role as a CHA supervisor. The project provides them with mobile phones, job aids, and bicycles for village supervisors and motorbikes for supervising health facilities. CHA-specific registers and reporting forms were developed for integration in district health information systems. The project also directly provides CHA with a specially designed kit of medicines, supplies and equipment, including a mobile phone and a bicycle. Efforts are under way to develop resupply mechanisms managed by the district governments utilizing project funding. Despite ongoing programs, remaining weaknesses were identified in the district referral systems, thus, the project is supporting the development and implementation of locally designed strategies to strengthen district referral systems based on contextual evidence and the requisites for referral systems proposed by Murray and Pearson . Because a whole systems approach was required, the referral intervention is being implemented at the district level. The design takes into account the required layers of coordination starting with prompt decision making at the household level; timely referrals from communities; appropriate triaging and pre-referral care; rapid transportation; and responsiveness at receiving facilities [43, 44]. The project activities aim at improving the functioning of the system to respond to all emergency health conditions, with emphasis on obstetric, newborn, and child complications. These activities are linked to and draw upon the presence of the CHA to inform families about early warning signs of complications and facilitate early referrals, as well as to mobilize the development of community-based emergency mechanisms. The intervention was informed by a mixed-methods formative research study conducted in the three districts. The research found that each district had planned and implemented some strategies and activities but none met the requisites of a strong referral system . Furthermore, the responsibility for referral transport was typically borne by the woman and her family, resulting in delays and catastrophic expenditures. The formative research findings were used to inform the development of district-specific plans. These plans were developed through participatory action research and planning exercises that engaged stakeholders at district and community levels. Strategies will be implemented by the districts with local resources as well as Connect financial and technical support. Funds mobilized by the districts will support advocacy with local politicians, upgrading health centers to provide emergency care, establishing hospital-based emergency teams, and including emergency care in supervision visits. Components supported by the project include improvements in ambulance transportation; establishment of an emergency telemedicine support, and advance communication system using mobile phones; clinical improvements in staff skills and patient flow for triage and pre-referral care; community mobilization mechanisms initiated and facilitated by CHA; and introduction of standardized emergency-referral forms. The evaluation of the added value of the CHA is designed as a community-based cluster-randomized trial set in three HDSS villages to measure reductions in child mortality and outcomes related to reproductive, maternal, newborn, and child health. Table 3 presents examples of key outcomes of interest [45, 46]. The district-wide emergency referral evaluation relies on facility and systems-based data. A plan of implementation research will complement this data, as well as an economic evaluation to assess the overall costs of the program. Ethical approval has been received from the institutional review boards of the IHI, the Tanzanian National Institute of Medical Research, the Tanzania Commission for Science and Technology, and Columbia University. Permission to conduct the intervention and corresponding research was obtained from relevant district and village government authorities. The trial has been registered with the International Standard Randomized Controlled Trial Register (#ISRCTN96819844). In addition, all reporting will follow CONSORT guidelines for cluster-randomized trials . Villages were randomly assigned to either CHA intervention or comparison within four strata defined by village population size. This ensured that large and small villages would be equally represented in the intervention and control arms of the study. Village boundaries were identified from official government records. Intervention and comparison areas were tested for comparability in baseline mortality and key MNCH behavioral indicators. Analyses confirmed that the sample is balanced, with statistically insignificant differences between the two study arms for each metric tested. A possible limitation of the design is the potential for clientele of comparison communities to seek care from CHA who are based in nearby treatment communities. To address this possible bias, research modules have been developed to assess comparison-area client exposure to CHA services. This information will permit statistical adjustment for cross-cell contamination. In addition, villages vary in distance to nearest health facility and health facility staffing. Some villages have a dispensary or health center and others are served by facilities outside their boundaries. Other biases could arise if project-provided supplies are differentially accessible to CHA relative to workers based in dispensaries. To address these biases, statistical adjustment will be made for distance to nearest health facility, health facility staffing, and disruption of key supplies at the dispensary level. Finally, an index of health systems strength developed will be included in multivariate models; CHA public health impact may vary according to the strength of the health systems in which CHA are placed. Based on this information, Connect has developed a counterfactual basis for analyzing project impact on mortality, particularly measures of child mortality, and other measures of impact in comparison and intervention areas. Since Connect is a true experiment, and prior demographic trends are available, rigorous application of hazard regression models is possible. This permits the multilevel modeling of individual prospective longitudinal survival as a function of childhood, familial, community, and programmatic covariates; treatment indicators are adjusted for the population density of CHA exposure, distance-to-service points, and other confounders, such as maternal age and educational attainment, household distance from fixed service points, household relative economic status, and extended family size and composition . The imposition of “time-conditional” models will permit analyses of the survival of all children who have ever been under 60 months of age during the Connect Project period. Evaluating CHA impact on child mortality relies on the HDSS, a longitudinal data system which collects relational data from households three times annually. Mortality events are registered in conjunction with migration and births, providing a basis for monitoring the risk of childhood death. Conventional procedures for assessing cause of death will permit appraisal of maternal mortality and causes of child mortality . In addition, HDSS modules in the study area have been added to assess proximate determinants of fertility, allowing for detailed analysis of the fertility impact of the CHA. Hayes and Bennet’s formula published in 1999 for simple sample-size calculation for cluster-randomized trials was used to determine the level of power available to detect the effects of the intervention on health outcomes . Connect embraced Van Breuklen et al’s approach to adjust estimates of statistical power for the loss of efficiency that arises from assigning CHA treatment in clusters, by village . Based on these procedures, we have demonstrated that the study design has 80% power to detect 18% change in under-5 mortality, 20% change in infant mortality, and 25% change in newborn mortality. Connect will use the detailed registration of demographic information at the individual level to closely monitor changes in intervention and comparison villages. Linked information on individuals, parents, households, or localities provides opportunities to model survival processes as a function of characteristics of their social or economic circumstances. Additionally, a household survey with a sample of approximately 3,300 women of reproductive age was conducted at baseline and will be conducted at endline in the study area to gather additional information on behavioral and care-seeking patterns. These data will permit individual-level analyses, providing a rich picture of relevant health seeking and service utilization trends and pathways at baseline and, by the end of the project, to explain the patterns that underlie survival impact, including patterns associated with care seeking and referral for maternal, newborn, and child emergencies. The emergency referral strengthening interventions cover the entire districts and address emergency health conditions among all members of the population, with a focus on pregnant women, newborns, and children under 5. Since only three districts are included in the design, randomization of the referral intervention was not possible and overall assessment of the referral component of Connect is constrained to a pre-post case study. To this end, data extraction from referral forms will be used to assess changes in volume and patterns of emergency referral systems [52, 53]. Referral forms will also be used to establish whether changes occurred after introduction of the interventions . Criterion-based audits on emergency-referral cases at baseline and endline will be used to assess changes in quality of management in these cases . Health facility surveys, based on Service Provision Assessments and needs assessments for emergency obstetric care, will be conducted at baseline, midline, and endline for cross-sectional assessment of the relative strength of the health system, particularly as relates to maternal, newborn, and child health and ability to respond to health emergencies. The primary analysis of these data will develop a model that is used to generate measures of facility strength and preparedness for emergencies . This method will provide data for assessing changes related to the provision and utilization of emergency services, particularly for acute maternal, newborn, and child health conditions. The facility survey will also provide data on the health system contextual factors that may affect CHA performance. The referral system will be monitored in the 101 HDSS communities according to the pace and location of the introduction of CHA support for the referral system. Referral related demographic outcomes — such as maternal and early neonatal deaths in CHA exposed and unexposed communities — will be used to determine if the phasing in of referral has been helped with CHA support relative to having referral logistics without CHA implementation support. Connect will also conduct research using non-mortality referral system outcomes as endpoints. This will test whether the CHA role improves the emergency referral system since indicators will determine whether the referral system works better in villages with CHAs. To complement the impact and outcome evaluations, a parallel research agenda will examine the “black box” of mechanisms along the causal pathway that led to the observed changes . This type of complementary research is increasingly recommended for trials of complex health systems interventions due to the challenges in assessing what contributed to the observed effects (or lack thereof) and the inherent dynamic nature of systems [58–60]. This complementary research will consist of documenting and analyzing the activities and processes (both planned and unplanned) that occurred to implement the intervention, including how, why, and by whom the processes occurred and how contextual factors both within and outside the formal health system influenced implementation. Quantitative and qualitative findings will be triangulated to provide a rich picture of the implementation processes and moderators and will permit a realistic evaluation of the Connect interventions [57, 61, 62]. Ongoing monitoring and feedback as part of this research will allow a process of refinement to improve implementation in collaboration with the CHMT, supervisors, and CHA. To guide this research, a framework drawing from relevant literature was developed encompassing measures and concepts of the processes and potential moderators of implementation related to the intervention, the implementers, the system, and the context [63–66]. The framework includes measures of fidelity or adherence in implementing the intervention as per the design — an important potential mediator and moderator of the relationship between the designed intervention and the observed outcomes . Measures are related to CHA service delivery but also to systems-level CHA supports and strengthening of referral. For the CHA services, for instance, adherence includes measures of whether services were delivered to the intended target populations (coverage), whether CHA provided the services intended (content), and how often they interacted with clients (frequency) [59, 68]. These data will be captured through the HDSS, routine statistics from the CHA, the endline household survey, and assessments of CHA quality of care. Potential implementation moderators will also be assessed through qualitative and quantitative methods. Qualitative methods will be used to explore concepts related to 1) the characteristics of the intervention, such as perceptions of its complexity and relative advantage over other interventions; 2) characteristics of individuals implementing the intervention, such as their perceived ability to perform the required tasks; 3) characteristics of the organizational setting, such as system priorities and leadership engagement; and 4) the responsiveness of the community in terms of acceptability of the intervention. Other contextual information will include village characteristics and relevant social, political, and economic events that occur during the course of implementation. “Qualitative systems appraisal,” a regimen comprised of focus group discussions and in-depth interviews, will be conducted at different levels of the health system every six months to capture these perceptions . The performance, satisfaction, and motivation of the CHA and involved emergency referral health workers will also be analyzed utilizing quantitative methods. Periodic self-filled questionnaires and routine statistics will be used to capture these data. To date, 113 CHA have been deployed to all 50 randomly selected intervention villages as planned. The emergency referral component, which is a district wide intervention, has completed the planning process and a number of initial activities, such as provision of transport and initiation of the emergency support telemedicine system. Based upon triangulation of monthly reports from field implementation coordinators, monthly statistics from CHA, examinations from training, and preliminary analysis of qualitative interviews and focus groups with stakeholders from multiple levels, we have drawn some initial implementation findings, which are described in Table 4. These areas are still under research and, as the study progresses, will be verified. The results from the training showed that the recruits, with the specified qualifications, could be trained to properly apply the principles of community IMCI and manage uncomplicated cases of diarrhoea, pneumonia and malaria as well as provide a broader package of reproductive child health services. CHA have largely been able to provide the package of care in the real world context of their villages. Reports show that acceptability of the CHA and their services among a variety of stakeholders, including communities, health workers and district management, has been high. In addition, the supports designed for the CHA appear to have facilitated their work. At national level, processes are underway to define a new cadre of community health worker and Connect operational evidence has played an important role in these processes. In addition, the district and village authorities have been instrumental in facilitating the CHA introduction and mediating any problems or challenges encountered. The engagement for the referral planning has provided a solid foundation for ensuring the relevance of strategies to local conditions. There are nationwide supply chain challenges which include frequent stockouts of some essential medicines for RCH. As a result, the project has had to use vertical procurement mechanisms for the CHA. These stockouts also compromise the CHAs ability to provide added value to the system and to facilitate effective referrals and will affect the system’s ability to respond to emergency cases. The decision not to pay village supervisors to support the CHA, who are paid, has produced tensions that may have undermined this relationship. Village supervisors report both that they are doing more than requested and that they need more tools and motivation to do this work. Early findings reflect a widespread struggle among CHA to achieve a balance between the treatment and educational or promotional aspects of their role. This may reflect demand in addition to other factors as communities’ prioritized the provision of medicines more highly than other services. Based on early implementation experience, areas served by one CHA were increased to two as many of these areas are large geographically even if populations are small. While the basic contents of the CHA kit were found to be largely appropriate, some medicines and supplies were later added based on feedback, for instance for first aid (e.g. iodine) and rapid diagnostic kits for malaria. While it was expected that the planning process could be completed rapidly, while underway, additional stages were added to ensure that groups typically excluded from these processes, such as local transport drivers, were able to have a voice. The Connect research design, in general, permits a unique opportunity to test the added value of a community health worker program on reducing child mortality, as well as improving behaviors and care seeking related to reproductive, maternal, newborn, and child health with a rigor that has been rare in similar studies in Africa . The project uniquely tests the delivery of an integrated package of reproductive and child health services at the household level, rather than focusing on one particular disease or particular type of service. Connect is also designed to address key research priorities related to strengthening emergency referral systems for MNCH. By combining these two elements, Connect seeks to test operational interventions that close gaps in the “vertical” continuum of care from household to health facility [70, 71]. Connect’s triangulation of demographic surveillance, cross-sectional panel surveys in households, and process evaluation will provide a rich picture of the programmatic and behavioral pathways that link program exposure, health systems strengthening, and changes in health outcomes and survival. These data are particularly important at a time when there are global calls to strengthen the continuum of care, including massive scale-up of community health workers in lower and middle income countries [68, 72]. Connect represents a rigorously evaluated study that addresses the design limitations of other studies that have been fielded for assessing the added value of community-based primary health care workers in Africa . In addition to Connect’s significance in advancing evidence for global and regional purposes, perhaps, most importantly, its links to national policy create an opportunity to provide evidence in support of efforts to reform how primary health care is delivered across Tanzania. This work was supported by the African Health Initiative of the Doris Duke Charitable Foundation. Comic Relief UK also supports Connect interventions and research. Additional support was provided by the Bill and Melinda Gates Foundation for the formative research on emergency referral and the Maternal Health Task Force to initiate the mobile phone component of the project. We would like to acknowledge the contribution of Connect team members at Ifakara Health Institute to the development and execution of the project intervention and research program including: Dominic Mboya, Hildegalda P Mushi, Gloria Sikustahili, Kassimu Tani, John Noronha, Idda Kinyonge, Samuel Likasi, Doroth Maganga and Harun Machibya. The authors would also like to acknowledge the following who contributed to early conceptual development of the study: Godfrey Mbaruku, Selemani Mbuyita, Honorathi Masanja, Salim Abdulla, Lynn Freedman, Don de Savigny, Joanna Schellenberg, and Hassan Mshinda. KR participated in the design and coordination of the study and drafted the manuscript. AH participated in the design and coordination of the study. MK led the baseline statistical analyses. EJ participated in the design of the study and led the randomization and sampling. AM participated in the randomization, sampling and baseline analyses. SP participated in the design of the CHA intervention and training program. FM designed the economic evaluation. CB contributed to the design of the study and drafting the manuscript. SH participated in the design of the study, sampling and baseline statistical analyses. JFP conceived of the study, and participated in its design and coordination and helped to draft the manuscript. All authors read and approved the final manuscript.